Ever wondered how to stop spam getting to you when your spam filters don’t pick up junk mail? Try out Mailwasher and see how easy it is to remove spam before you even receive it! 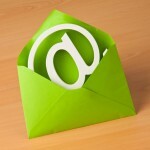 You can trial download Mailwasher Free.